Gateway into Bali: Stereo Aids - Manufacturers of Mirror and Pocket Stereoscopes. Publishers of 3D Imagery. Input data and create new layers of information. Each topic has a student based activity. Rich variety of maps, graphs and photos. Learn language in daily use. GIS - Australia's first GIS specifically for education. 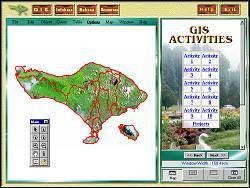 An educationally designed Geographical Information System (GIS) program based on Mapinfo. The dataset contains multiple layers of information that includes: Grid, Bali coastline, contours, regency boundaries and capitals, villages and boundaries, main and minor roads, rivers, soil types, land uses, rainfall, forest areas, population and tourism data The module contains a set of graded activities that cater for beginner through to advanced users of GIS, containing helpful step-by step instructions that guide the student in early activities. 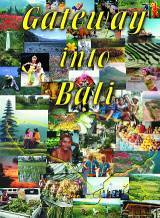 Infobase - An interactive presentation of Bali. Bahasa Indonesia - A practical introduction. Designed as a 'taster course', but also useful for students already familiar with the Indonesian language. The course is a practical guide to the use of Bahasa Indonesia and contains cultural references in usage. The interactive course includes: An introduction. Greetings. Introducing yourself Asking questions. Buying and spending in Bali. Transport and travelling. Eating out. A helpful phrases section is also included.